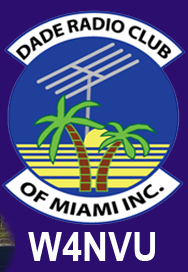 November – W4NVU – Dade Radio Club of Miami Inc.
Julio called meeting to order at 19:39. Julio presided over the meeting and welcomed everyone. The meeting was not broadcast live on the air tonight from the EOC. There is testing being conducted. Everyone took turns and stated their name and call sign. Reading of the Minutes – Dani stated the Officers and Board of Directors are incorrectly listed on the October’s minutes, but there was no quorum, therefore the minutes cannot be approved. Secretary – Joanne is not present, nothing to report. Corresponding Secretary – Lloyd stated there is no mail. Treasurer’s Report – Lee reported he needs to reconcile the bank account. 2 new members today and 2 prior to the meeting. $300.00 ARRL fee was paid. $300.00 fee was paid for the Holiday Party. Website – Suggested changes were made. Lee suggested that we publish a membership list/directory. Dave Thompson informed the club he has 2 repeaters that are not on the club site. Julio stated he will add them to the website. PIO/Holiday Party – Dani spoke about the Holiday Party. It will be held at John Martin’s on Friday, December 14th. It will be $25.00 per person. Dani also brought up the fact that the holiday party will be on a Friday this year. The club voted and there will be a meeting in the month of December. Miami Marathon – Ben Nemser spoke about the Miami Marathon and he recruited for the event. Merritt stated he would like the same post as last year and encouraged others “to use their license”. Junior Orange Bowl – Brandon spoke about the Junior Orange Bowl and he recruited for the event. Brandon suggested that he could pair new Hams up with experienced Hams. Troop 280 – Jason spoke about the demonstration/jamboree he and Julio assisted with for a local Boy Scout Troop. Armando – 15 new hams from a 3 Saturday long training that Armando hosted. There will be another class in January, beginning on January 12th in Miami Beach. Also, a hands on exercise will be this weekend in the Parking Lot of the EOC, this Saturday November 17th from 10:00 – 2:00. The 147.000 – Jason stated, we are waiting on the Club Insurance renewal. 925 . PL – The information listed on the website is incorrect. PL is 103.5 and the Nack A55. The 147.760 – Ray reports it’s up and running, with very little traffic. Please use it. The 444.200 – Jason reports repeater is on air and it’s working great. 875 – Merritt reported the repeater is down. Dani is willing to coordinate with her department at Baptist for potential sites. D-Star – No info reported. Emergency Committee Chair – Lloyd reported about the potential disturbance. Net Manager – No net, the week of Thanksgiving. Numbers are low, please check in. WebEx – Armando spoke about the recovery efforts in the panhandle. Julio spoke about his experience in the panhandle after Hurricane Michael. StarNet was very active. Ray spoke about the cellular in the panhandle. Testing – 1 new tech and a general upgrade. New Business – Ray spoke about a wide area dispatch channel is coming out. Hambulance needs to be cleaned and the tires need air. Merritt will come up with a game plan to empty the Hambulance so it can be sold. Julio made a motion to adjourn, seconded by Bryan. The DRC meeting was adjourned at 19:56.